The camera captures the moment when the wall of tephra that had been holding back the Crater Lake failed, triggering the spectacular lahar. 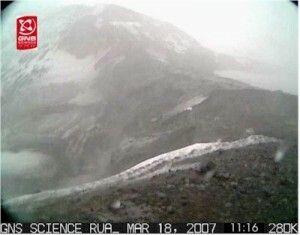 The fixed Campbell Scientific CC640 digital still camera supplied by Scottech was installed by GNS Science near the summit of Ruapehu overlooking the downstream side of the barrier in early January, and had been taking pictures at one minute intervals during daylight to monitor the development of erosion scarps and to attempt to capture unique pictures of the dam failing. "All the sensors and instruments installed in the path of the lahar worked perfectly", Director of the Volcanic Risk Solutions Group, Dr Shane Cronin. "We have collected a world-class dataset that will make this the best-studied lahar ever," GNS Science lahar project leader, Dr Vern Manville. Other instruments supplied by Scottech include Geokon load cells, Druck & HOBO pressure transducers and Vega radar water level sensors to detect and record the changes in the lahar as it flows down the mountain. Campbell CR1000 and CR800 dataloggers recorded the outputs from these and other sensors, used by Massey University and GNS, to monitor this spectacular event. 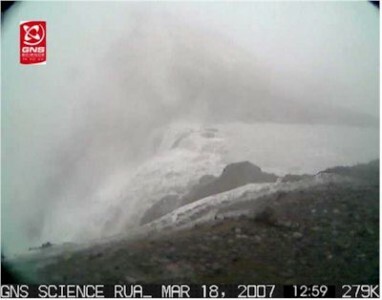 Almost an hour later the level of Crater Lake has fallen substantially and flow through the breach has waned.